Increased economic and environmental pressures have caused many of you to re–assess the way you manage turf. With fertilizers as one of the bigger inputs, we felt that it was time to review and revise our current soil guidelines to reflect these changes. 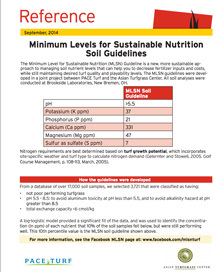 The result is the "Minimum Level for Sustainable Nutrition" (MLSN) soil guidelines, a new, more sustainable approach to managing soil nutrient levels that can help you to decrease inputs and costs, while still maintaining desired turf quality and playability levels. Used in conjunction with Climate Appraisals and Growth Potential, annual fertilizer needs can be estimated. Working together with Dr. Micah Woods of the Asian Turfgrass Center, the guidelines were produced through review of key soil nutrient data from thousands of turf soil samples. Based on our evaluations, we determined that in many cases, guidelines could be safely lowered without a dramatic impact on turf quality or playability. Since their introduction in 2012, the MLSN guidelines have been adopted by turf managers around the world, who have been surprised to find just how "low they can go" as they more precisely target the nutrient levels that the turf needs. Stowell, L., Woods, M. and Gelernter, W. 2014. Only what the turf needs: updating the Minimum Levels for Sustainable Nutrition Guidelines. Crop Science Society of America meetings, November 5, 2014. Woods, M., Stowell, L. and W. Gelernter, 2014. Just what the grass requires: using minimum levels for sustainable nutrition. Golf Course Management, January, 2014. Haines. J. 2014. Sustainable fertilizer use. Thayer, A., 2013. Cut costs with better turf management. Western Turf, Winter, 2013. Gelernter, W., Stowell, L and Woods, M. 2013. Documenting your progress toward sustainability. Golf Course Management, December, 2013.